No time to read, just need to get your peppers planted? Check out my previous post, How To Transplant Sweet Pepper Seedlings, the Extended Version. Then learn how easy it is to freeze your beautiful bounty (no special equipment or boiling required) here. The completion of a planting project feels even more rewarding when you finish up right before it starts to rain. Any gardener who has ever flipped through a seed catalog knows that the best thing about growing vegetables and herbs from seed is that you have a much larger variety to choose from. Sometimes even too large, as any gardener who has ever suffered from Eyes Are Bigger than the Garden Syndrome can attest to. Those of us who usually start our plants from seed quickly become spoiled, especially if we need to purchase pepper seedlings in a place where, as my Amish neighbor who moved here from Ohio a few years ago and sells his extra garden bounty once put it, "Nobody around here likes sweet red peppers; they only want green." Green peppers are one of the few foods I despise. Of course any pepper plants are better than none, and so you do the best you can, plunk down nearly $4 per scrawny little specimen when you must (even if it almost kills you), feel grateful for what you are able to find, and vow to do more than just paw through your large stash of marvelous heirloom red, orange, and yellow sweet pepper seeds next year. When buying vegetable and herb plants, I like to rationalize what seems like a high price—especially if you're used to getting at least a couple of dozen plants from one $2 packet of seeds—by comparing the cost of the plant to the cost of buying the bounty. For example, I routinely see non-organic, often imported, and probably not very flavorful orange and red bell peppers selling for up to $3 apiece in the supermarket. Even though I never buy them, just seeing them makes me feel a lot better about spending $4 on one pepper plant. Most commercial nurseries, home centers, and other big stores usually have a very limited variety of sweet pepper (and other) plants, and unfortunately most of them are often hybrids. I wasn't familiar with King Arthur sweet bell peppers when I bought some seedlings from a local nursery a year or two ago, but the description—Very large, blocky peppers mature from green to red, disease resistant, 60 to 75 days, fruit size 4.5" x 4.5"—sounded fine, and the tag didn't say hybrid. Fortunately for us heirloom lovers, the hybrids, especially the newfangled ones, are often marked because they're copyright, or copyplant, or whatever it's called protected. Did you know that if you save seeds from a hybrid plant, what will end up growing from the seeds won't be the same? Another good reason to stick with heirlooms. The King Arthur plants did fine in my garden, and the peppers tasted pretty good, so when I missed pepper seed starting season again this year, I snapped up two four-packs (thankfully just $1.79 each) during a recent trip to that same local nursery. On Friday afternoon, I put all eight plants in one of my falling apart 4'x8' wood raised beds, along with three Red Rubin purple basil seedlings that appear to have survived the mysterious wilting, possibly mildew disease the other five succumbed to a few weeks ago, which I wrote about in my recent post, Bad Luck with Basil and Some Basil Growing Tips. (Thanks for all the great comments on that post!) A few years ago I fell in love with purple basil; find out what to do with it and why I love it so much, plus a recipe for my favorite pesto and the easiest white bean dip ever here. I really need to do some more research into that problem, because I think it may have even killed one of the $4 pepper plants. The green basil seedlings I also wrote about in the above mentioned post (the ones I also almost froze to death) seem to have outgrown it, possibly because I put them out in the soil and sun. I'll let you know if I figure anything more out. Anyway, I spaced the pepper plants in the raised bed the same way my mother always set cookies on the baking sheet—two, then one, then two, then one, etc. Only she always made little cookies so it was three, two, three, two. This gives the plants (and cookies) more room to spread and makes better use of the space. It also allows you to tuck some companion basil plants between them. According to The Vegetable Gardener's Bible, my favorite gardening book, other good companions for peppers include carrots, onions, parsnips, and peas. Bad companions are fennel and kohlrabi. 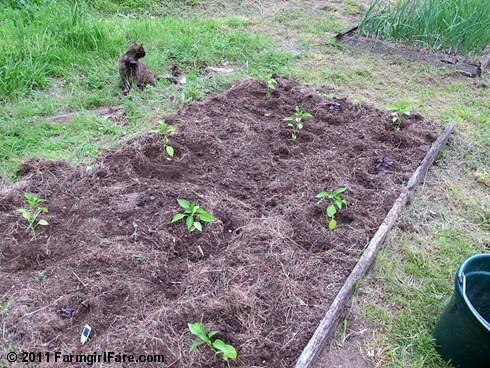 When rotating crops, don't put peppers in a bed where you've just grown tomatoes, eggplant, or potatoes. Sometimes pepper plants begin to form flower buds before the root system is large enough to support a large crop. Remove any blossoms that appear before transplanting time and for about a week afterward. Peppers like each others' company and grow best when close enough so the leaves of the mature plants are barely touching. As my mother used to say, "Peppers like to hold hands." If you're not sure how big your pepper plants are going to get, a little extra growing room is better than not enough. It's best to transplant your seedlings on a cloudy day. They'll already be stressed going into the ground, and wilting in the blazing hot sun all day won't help. If it's not cloudy, wait until the late afternoon or early evening to plant, especially if it's hot. If your seedlings have been growing indoors or in a greenhouse, be sure to harden them off for at least several days before transplanting by putting them outside for a few hours at a time, gradually increasing the number of hours each day. This pepper bed will eventually be mulched with a thick layer of manure (probably from our 16 chickens; more about my experiences using chicken manure in the garden hopefully soon) and then topped with a thick layer of grass clippings. This will add nutrients to the soil while effectively blocking out weeds. Super sweet, brilliant orange fruit are blocky and good sized with thick flesh that is flavorful and among the best tasting of all peppers. Plants produce large yields of this most magnificent pepper. That will give me a total of 20 pepper plants, which should hopefully provide enough bounty to eat fresh and roast for recipes, with plenty left over to freeze and enjoy next winter. You don't have to blanch or boil water to freeze sweet peppers; learn how easy it is to freeze sweet peppers here. So are you growing any sweet peppers this year? Any stories, tips, advice, or fun stuff to share? © FarmgirlFare.com, where every time I sit down to write one of these gardening posts I tell myself it's only going to be a couple of paragraphs long, so it's probably a good thing that I don't dream of someday completing a novel. I planted 1 "chocolate" bell pepper and it's looking really good. I found it on the clearance table at a local big box. I planted 3 yellow peppers that all look terrible, and I planted 3 reds that look reasonable. Then I have a jalepeno on the front porch. I have actually been really thinking of pulling the yellow peppers out and planting something else. I planted one Tolli's Sweet Italian pepper plant this year. I purchased the seeds a few seasons ago from Seed Saver's Exchange and they are still viable. One plant is plenty for just two of us and our limited gardening space. We've had some very rough weather though and while it is starting to bud, it isn't looking too pretty. I also have a copy of the Vegetable Gardener's Bible and enjoy using it for reference. Thanks for the info. It sounds boring, but we have a green bell, a red bell and a jalepano. I'm with you on not particularly liking green bell peppers. They don't sit well on my stomach and are too strong tasting to me. I prefer baby red/orange/yellow sweet peppers. They don't overtake a dish. Mine went in today! I'm thinking I should reorder them though upon seeing your cookie pattern. This year: more peppers, less tomatoes! My daughter and I planted 40 pepper plants of various types....looking good so far. 25 of them planted from heirloom seed from Bakers Creek seed catalog. We planted several hot peppers and then the standards along with some Italian. I sure hope they do well. Do you cmpost your chicken manure? I have 6 chickens and haven't used their manure for anything but the compost pile yet. We plant (4) Red Carmens every year along with a couple of Jalapenos and one or two other mildly hot varieties. The Carmen pepper is not as fleshly but has fantastic flavor and grills very well. Just put a bunch of bells in the ground here about a week ago. And a scattering of hotter stuff (Serano, Poblano, Cayenne). Tough to get a good crop of bells when you have a short growing season. Sometimes hybrids are the only answer. Note that any green bell pepper is just an unripe red/yellow/orange/chocolate... bell pepper. If you wait, it will ripen (and taste MUCH better for it). Peppers require so much heat and time to even germinate that I'm lazy and just buy plants. And not even heirloom ones either--just whatever I find at the local nursery. They never do well enough to provide me with all the peppers I like to have in the freezer for the winter, so I always buy a full peck of seconds at the farmers market in the late summer to freeze. I've got Albino Bullnose and pepperocinis in the hoop house. The ones I kept indoors under the lamps longer are obviously doing better than their brethren who were put out sooner. I haven't heard the "peppers like to hold hands" saying, but I like it and am glad that I spaced them closer together this year. The addition of a drip hose has been wonderful and has really helped cut down on mildew problems. I'm trying to overcome my fear of failure with pepper plants by growing a special variety of jalapeno this year that's especially good for jalapeno poppers - because I'm just *that* white trash. Leave it to junk food to get me out of my "I can't grow peppers from seed" rut. I have one red, one yellow, one green, one purple, and two jalapeno pepper plants in the garden this year, all started from seeds from Baker Creek. I spaced them a little further apart this year than last, I had them too crowded last year. My peppers never seem to get very big so I asked one of my friends from the Farmers Market how she got hers so large. She said "Let them grow!" Wise words! I love this: "Peppers like to hold hands." I forgot to mention two peppers that I grow : sheepnose pimento and super shepherd! The names got me---of course---but the customers love them! We built an inexpensive hoophouse for out tomatoes and peppers. They are really liking the extra heat. Those sweet red peppers must have put on some growth since that photo. It would be nice to see how they are now!